Shag Point is a wonderful destination with plenty of interest for the whole family. Situated about 1 hours drive out of Dunedin it makes a perfect day trip for the family, or in my case the landscape photographer. At Shag Point you will find cribs and holiday homes and maybe a small smattering of tourists who mostly visit the area for the stunning New Zealand Fur Seal colony. The seal colony is a real treat and provides a wonderful view of the animals as they lounge on rocky outcrops by the waters edge. However, wildlife is not what takes me to Shag Point. I am there for the same reason tourists flock to Moeraki, to photograph boulders. There is something to be said for being the only person on the beach when I took this shot below. The Moeraki Boulders are stunning, but the boulders at Shag Point are bordering on epic. Often the largest ones are located right by the cliffs at the back of the beach. The rock below was massive. There are key differences between the aesthetic of the Moeraki Boulders and those found at Shag Point. At Shag point colour and texture is extremely prevalent with algae, seaweed and rocks bejewelled with tiny shells. For me, Moeraki just doesn’t come close. 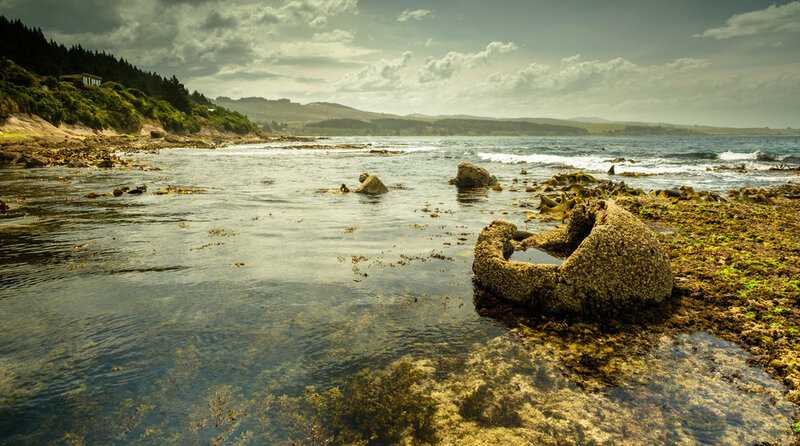 I could wonder for hours on the Shag Point shore line investigating rock pools and mind blowing rock formations. One thing to be aware of though is Sea lions, I met two on this particular visit. They really do look like rocks and the only reason I knew they were there was on both occasions the rock turned over and growled at me. Give sea lions plenty of room, if they want to move they can do so extremely fast. Also, I was attacked by 2 feisty oyster catchers who must have been protecting their nest, so I moved on quick smart. All in all, Shag point is a fantastic destination for an enjoyable day out with your camera.